This tutorial is the continuation of the previous tutorial Getting Started with ESP8266 (Part 1). So, to give a small recap, in our previous tutorial we introduced our self to the ESP module and learnt few basics about it. We also made a development board, using a FTDI Serial Adapter Module, which can be easily used to program the ESP module using both using AT commands and Arduino IDE. In this tutorial we will learn How to use AT commands to operate ESP8266 Wi-Fi Transceiver module. And in the next Tutorial we will learn to Program ESP8266 using Arduino IDE (without Arduino) and Flashing the ESP8266. The first and the easiest way to program your ESP module is by using the AT commands. The letters AT stand for “ATtention “. AT commands are the instructions which can be used to control a specific modem, in our case it is the ESP8266 module. An AT command always starts with the letter AT and is followed by some specific command. The complete list of AT commands which can be used to control and program the ESP8266 is given in documentation by Espressif Systems. The same can be found in the link below. You can read through documentation to understand what each and every command will do. But, for the purpose of this tutorial I am using only few commands just to check the firmware version of the module and set the module to work in AP (Access Point) mode. Step 1: Install any Serial monitor software. This tutorial uses Arduino Serial Monitor since most of us have experience by using it with Arduino boards. Step 3: Connect the FTDI board to your computer and open Device Manager, under COM ports you should see to which COM port your FTDI module is connected to, note it down. Mine is connected to COM20 as shown below. Step 4: Open your Arduino IDE, make sure you are connected to the FTDI COM port (mine is COM20). This can be ensured by checking Tools-> Ports. Now, open your Serial Monitor and select “Both NL&CR” and the baud rate as “115200” as shown at the bottom of the image in the next step. Note: Your baud rate might also differ based on your Vendor. If 115200 does not work, try 9600 and 38400 and 74880. If you have made it so far, then great!! 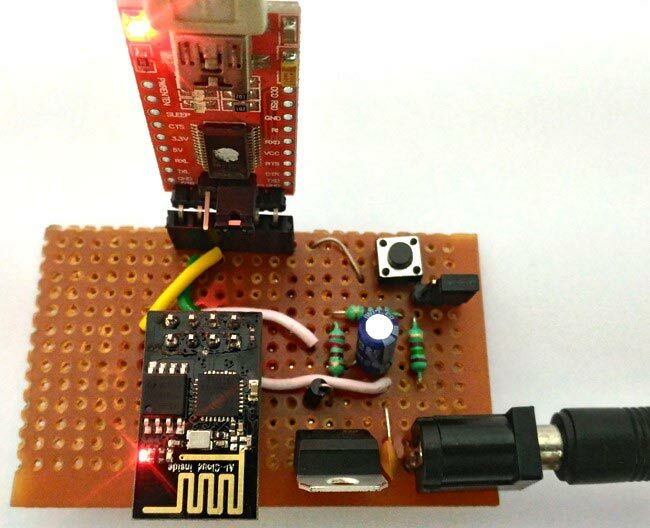 You can start programming your ESP8266 module using AT commands by using the datasheet. Just to make it more interesting, I will show you how to configure your ESP module in AP+STA mode and see how it works. Step 6: The first command that we would use is the AT command. It is just used to check if the start-up is successful. When you type in “AT” and press enter it should reply back with “OK”. Step 8: As said the ESP module can work in AP mode (Access Point mode), STA mode or both AP and STA mode. Lets run the module in AP mode so that we can check if the working. The complete steps and its working is also shown in the video below. So let us stop this for now, in next tutorial we will see “How we can program the module using Arduino IDE and How to Flash the ESP8266 memory”. Don’t forget to check our other ESP8266 based Projects.